Laadukkaat Venum Gladiator 3.0 nyrkkeilyhanskat. Erinomainen valinta nyrkkeily, thainyrkkeily ja potkunyrkkeily harjoitteluun. Train hard like a gladiator, with Venum Gladiator 3.0 boxing gloves! Featuring a triple density foam, these Venum boxing gloves are entirely handmade in Thailand, offering optimum shock absorption and effective protection of your hands. A Velcro closure system provides maximum support to the wrist and a custom fit for explosive punches. 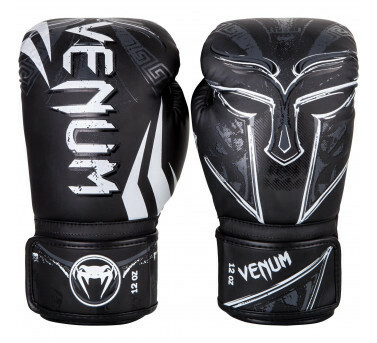 The Venum Gladiator 3.0 boxing gloves are adorned with a unique design that honors the ancient Gladiators, these legendary warriors who have marked the history of the Roman Empire and battle arenas. Product Features : Semi Leather: resistant triple density foam for optimum shock absorption. Attached thumb for better protection against injury. Ventilation system for optimal thermal regulation. Anatomic shape / Outstanding grip. Optimized protection metacarpal. Reinforced seams. Large Velcro closure for a precise fit and support. Long cuff for protection and increased stability of the wrist. 3D Embossed Venum Logo. Handmade in Thailand.